If you're making plans with friends to eat in Newcastle at the moment the chances are you'll find yourself in the new Grey's Quarter trying to choose between all of the new restaurants that have just opened. Curiosity has definitely got the better of me so when I made plans for a catch up with Kayleigh and Lisa, we decided to take the opportunity to try out another of the new restaurants in Grey's Quarter. 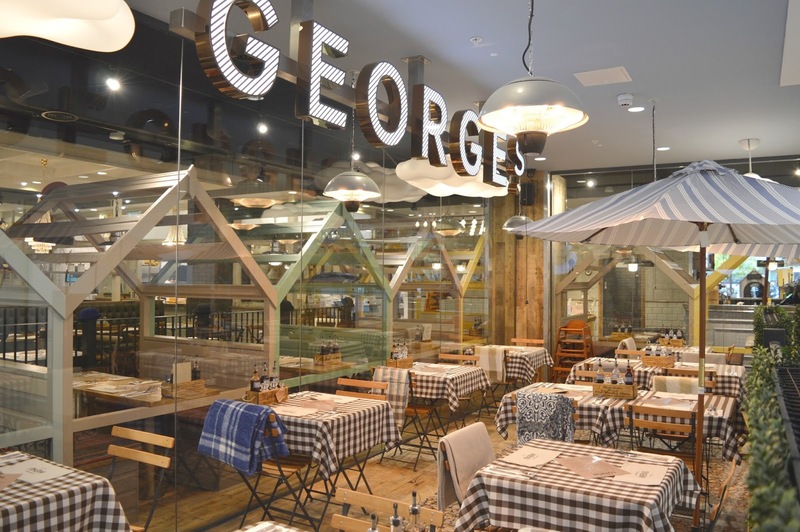 Of all the restaurants that have opened so far, George's Great British Kitchen has arrived with the most fanfare. They had a huge presence on social media for many months before the arrived with loads of updates and countdowns. So it was rather inevitable that I'd find myself there pretty swiftly after their opening. 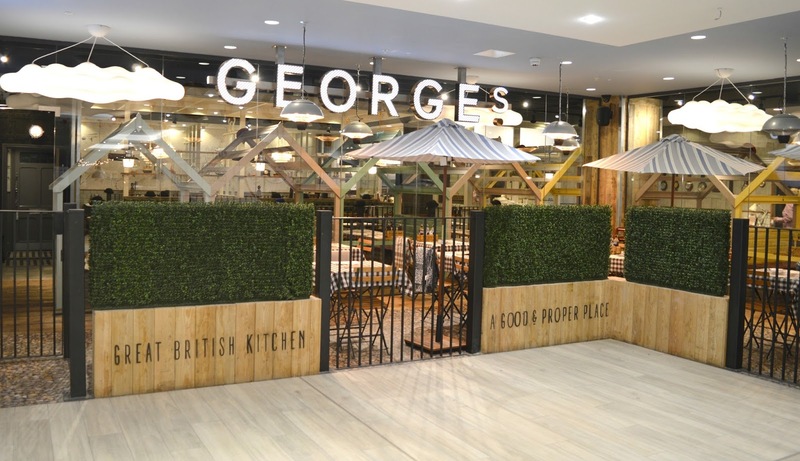 Like all of the other restaurants in Eldon Square's Grey's Quarter, George's Great British Kitchen is a chain restaurant but with only two places in the UK (the other being in Nottingham) it does feel a little more special than the more familiar chains that have dominated most of the other units. Promising Great British classics, George's Great British Kitchen cooks up British food, served in a unique way. Using carefully selected fresh ingredients served with a twist they are keen to give every dish its own personality. They've certainly made their mark in Nottingham, winning Best New Venue in 2015 and Best City Experience 2016 in the Nottingham Post Food and Drink Awards so it'll be interesting to see how they settle into their new home in Newcastle. 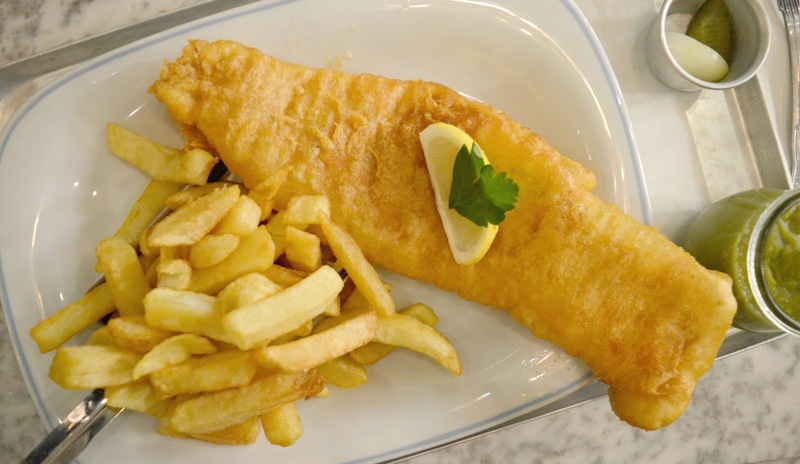 The restaurant is light and bright with a traditional British seaside vibe. I loved the little local nod with all of the beach hut booths being named after our local beaches, we had our eye on 'Bamburgh' but unfortunately had to settle for a normal table instead. The decor in Georges is amazing with so much to look at, I particularly loved the anchor light fittings and grand chandeliers (it seems the diners around us were loving it too, I saw a table near us do an entire photoshoot with a fish they'd found on a shelf) - it's a great place for a selfie! Looking through the menu was a real feast for the eyes with five pages of food to choose from (not great when you're indecisive like me!). As a recent lover of all things burger I was quite tempted to order something from the "In a Bun" part of the menu and their Proper Dirty Burger did sound rather tempting. 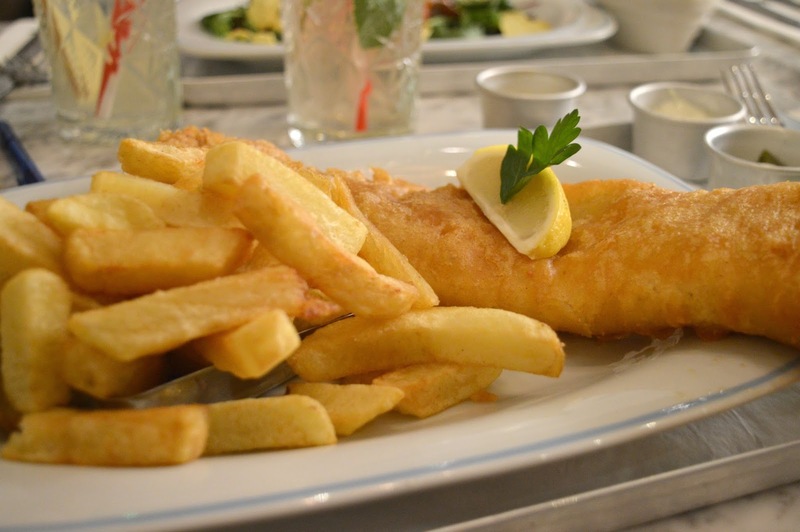 However, as George's Great British Kitchen are well known for their traditional seaside fish dishes, I decided that I really had to try some fish and chips. I ordered the Traditional Wild Ocean Cod (£12.25) - a giant piece of battered cod served with twice cooked chips, mushy peas and chunky tartare sauce. I honestly couldn't believe how huge the portion was when it arrived in front of me. The chips were served on a shovel and the fish was falling off my plate. I loved every mouthful, it was so delicious and I was rather upset that I couldn't manage to finish it all off but I needed to save myself for dessert. The dessert menu at George's is a thing of beauty. There were so many things that I wanted to try so I was very happy when Lisa and Kayleigh decided to order two of the dishes I had my eye on (I promise I didn't make them) which left me free to pick a third. I must have been thinking about Simon when I opted for the Warm Gooey Chocolate Orange Tart (£5.95) - melt in the middle chocolate orange served with vanilla ice-cream, chocolate sauce and a chocolate flake. Chocolate orange is his favourite thing in the world and I knew he'd be very miffed I didn't give this one a go on his behalf. Don't ask me how on earth I managed to polish the whole lot off after eating such a mammoth piece of battered cod, but I did it and it was heavenly! 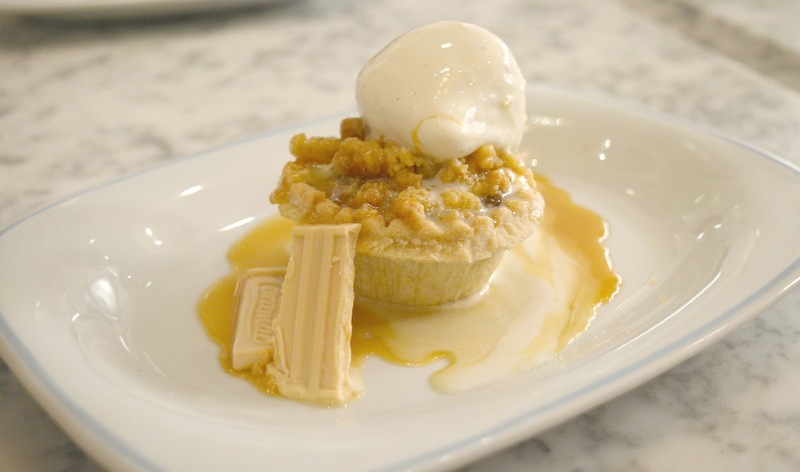 Kayleigh decided to order the Apple & Caramac Higgledy-Piggledy Crumble Pie (£5.95) - British bramley apple and caramac pie with crumble top, salted butter caramel sauce which was something I almost ordered myself. Kayleigh and I have been good friends for a few years now and this dessert made me decide that our friendship was strong enough to allow me to dip my spoon into her dessert! Don't worry, we're still friends and wow was her dessert beautiful! Lisa went for the Doughnuts (£4.75) - fresh homemade doughnuts with chocolate dipping sauce, raspberry dipping sauce and candyfloss on the side. I will admit that it was the candyfloss that really had me interested in this dish. I'm such a child! Candyfloss is a big thing at George's Kitchen - it features in a fair few cocktails and appears a lot on the dessert menu. It was certainly a talking point in the restaurant with people all around us giggling with glee every time they were presented with some bright pink floss. I stole a tiny bit of candyfloss from Lisa and although it was fun and immediately transported me back to my childhood I did think her dessert overall was a bit of a disappointment. She needed far more doughnuts for all of that sauce and, as we found out, dipping candyfloss into sauce just doesn't work. More doughnuts are definitely needed! 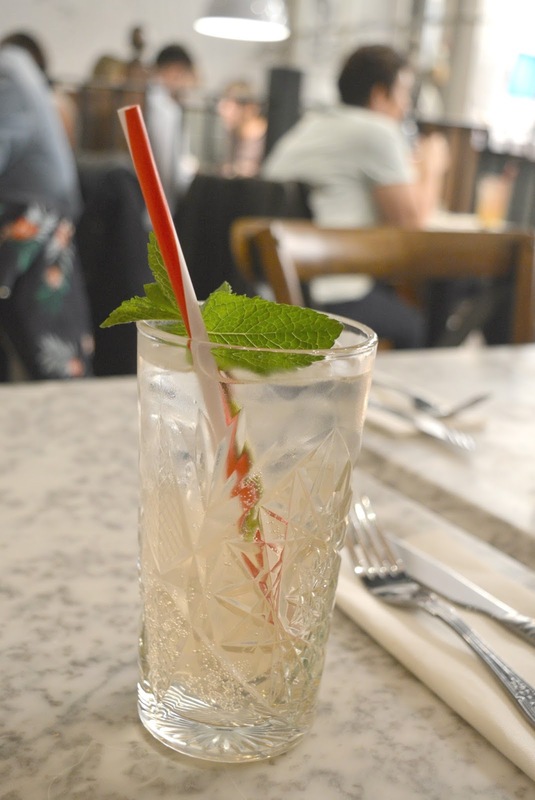 If you're a fan of gin then you're in for a treat as George's Great British Kitchen has it's very own Gin Bar. Gin bars are hugely popular in Newcastle with Pleased to Meet You, The Gin Bar and Bealim House just a few that are popular in the Toon. Despite it being a Friday night we were on the soft drinks for our visit, bit of a shame when the cocktail selection looked pretty decent. Luckily there is also a great variety of soft drinks on offer. I opted for the George's Rhubarb and Custard (£2.75) which tasted amazing! 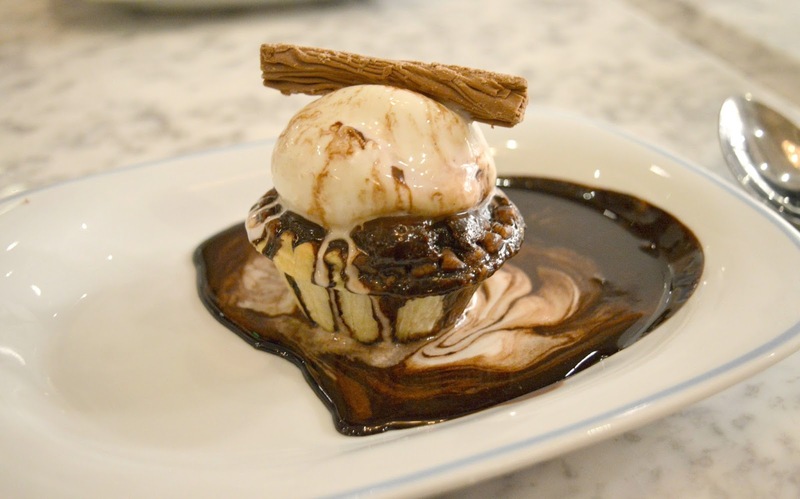 We thoroughly enjoyed our first trip to George's Great British Kitchen and I've certainly been talking about it quite a bit since my visit so I'm sure it's only a matter of time before I return with Simon. Let me know if you've been and where in Grey's Quarter I should head off to next! I'm thinking perhaps PizzaStorm! This looks IMMENSE!! The puddings especially have got me all heart eye emoji! You always post such amazing food haunts - I need to come to Newcastle! This place looks amazing! I passed through Eldon Square last week and noticed all of the great, new restaurants (I don't visit often). I love the sound of the décor and the desserts sound right up my street! I'll definitely be making a dedicated trip up to Newcastle soon just to try it. I think it will be hard for anywhere selling fish and chips to beat Colmans in South Shields but this place certainly looks like it's worth a visit for the lovely decor, handy location and epic desserts. Hope to try it soon! 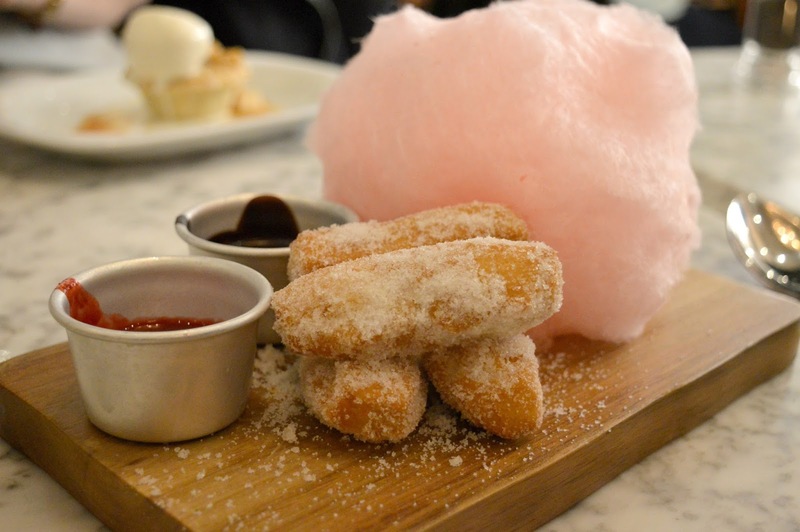 This is the restaurant I most want to try in Grey's quarter too, I think the photo of the doughnuts and candyfloss got me on Facebook although it does look as though the pudding could have did with some more doughnuts. I love the look of the booths and their fish cushions. My Mum and I always order different puddings too so we can try both! This looks amazing! I love the overall look of the place, as you say, it's so bright and light and those desserts.. oh, those desserts! They look so so so yummy! I want them all! is it milk or dark chocolate sauce on chocolate tart?